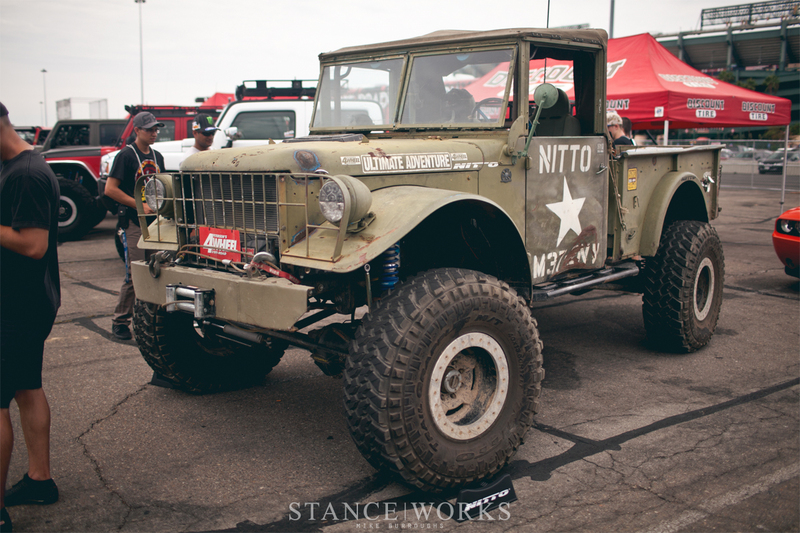 Last year, Nitto Tire decided to hold an all-encompassing event to celebrate automotive enthusiasm and the broad range of cultures it has spawned. From classic Japanese economy cars, to brand-new European sports coupes, and even lifted off-road trucks, Nitto invited all of Southern California's car guys out for an afternoon of drifting, giveaways, and most importantly, a good old-fashioned car show, free of charge. We toured the Anaheim Angel's lot, capturing our favorite attendees of one of the season's most impressively large shows. After strolling through the gates without spending a dime, a refreshing feeling for car shows these days, it wasn't long before our attention was caught by several of the cars in attendance. With their owners off and prowling for their own favorites, we did what we do best as we blended in with the crowd. 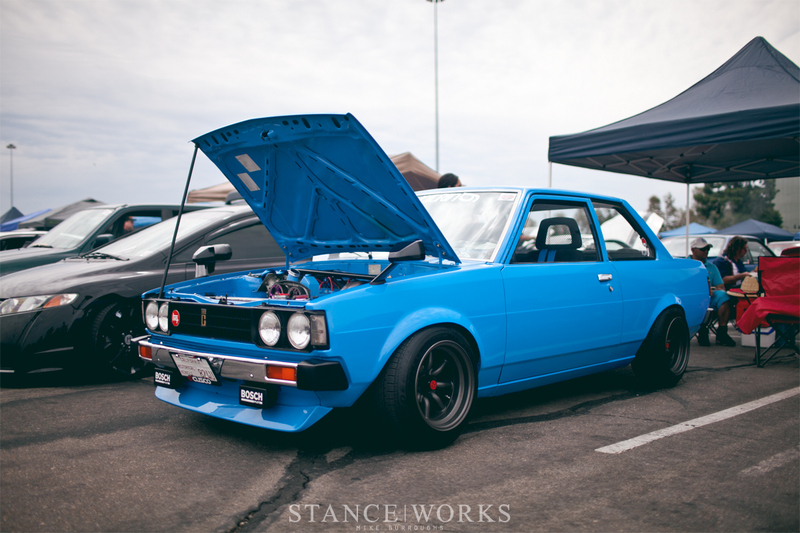 A vintage Toyota Corolla sat in a long lineup of cars as the first to stop us in our tracks. Its perfect smurf-blue paint kept in line with the quirky colors often found on cars of the era. Under the hood was a shaved bay, sporting a twin-cam ITB'd lump. Parked not far away was an NSX that represented the opposite end of the spectrum. 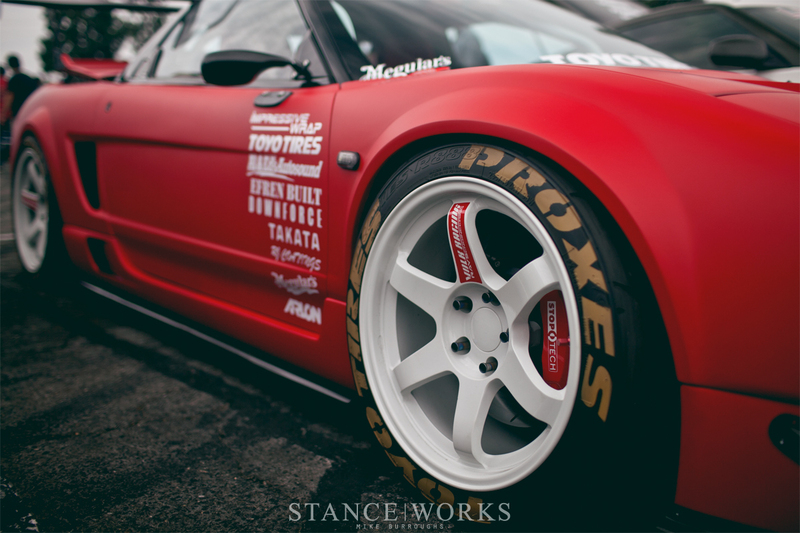 Flat red extra-wide bodywork, meaty tires, and Volk TE37s made for a very aggressive, modern look. 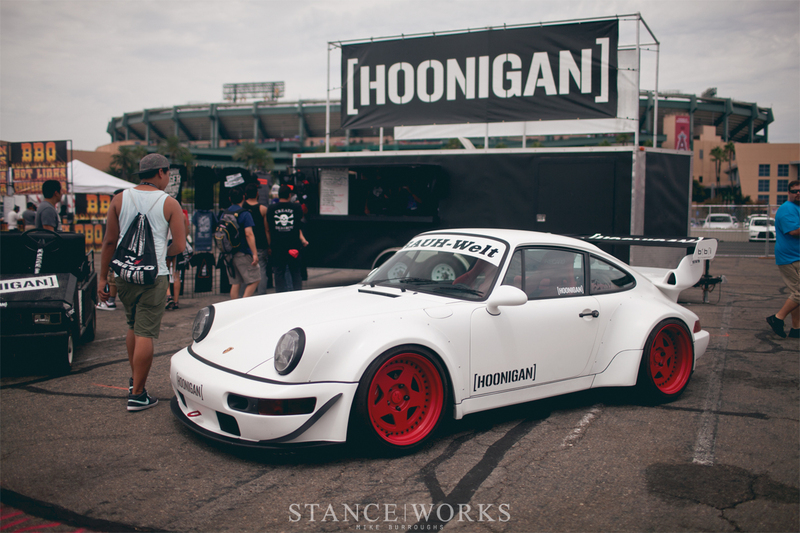 Wandering the grounds, we came across Brian Scotto's gorgeous RWB-bodied 965. As one of the first unveiled in the US, it's nice to see it still in the same hands, seemingly untouched. It sounds like odd praise, but on the other hand, several of America's RWB cars have gone through extensive changes and several owners since their creation. Brian's satin-white example sits atop a set of 3-piece Fifteen52 Tarmacs in satin red, with a red interior to match. 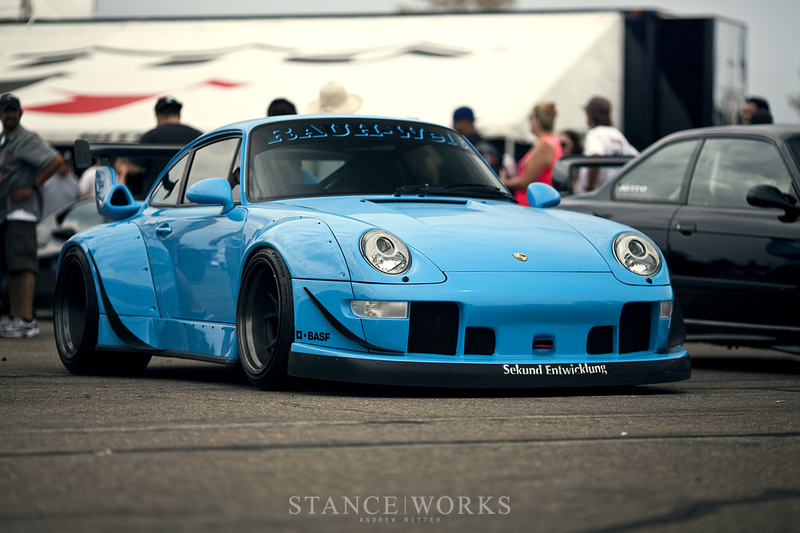 Among the RWB cars to undergo changes, Mark Arcenal's takes the cake. Originally unveiled at the same time as Brian's, Mark's was painted in a flat Signal Green. Since, it has received a color change to gloss black and Work Brombacher wheels.With tidbits of green remaining from it's previous stage, yet highlighting several important features such as the massive brake kit, the beautifully built cage, and more, there's no second-guessing which car it might be. It was hard to collectively decide which we liked better - Mark's, or Brian's - and fortunately, we didn't have to. As part of Nitto's show for the crowd, the Nitto-sponsored drivers were also part of Auto Enthusiast Day, present to give a full drift demo for eager onlookers. Vaughn Gittin Jr, Matt Powers, Chelsea Denofa, and Matt Field were all present, as well as their famed Formula Drift machines. With fans crowding the fence, shots were difficult, so we caught up with the cars and drivers as they returned to the paddock. The beautiful cars weren't the only vehicles to capture the attention of ourselves and our cameras. A large lineup of trucks lined the back fence, each one competing for height, size, and authority. 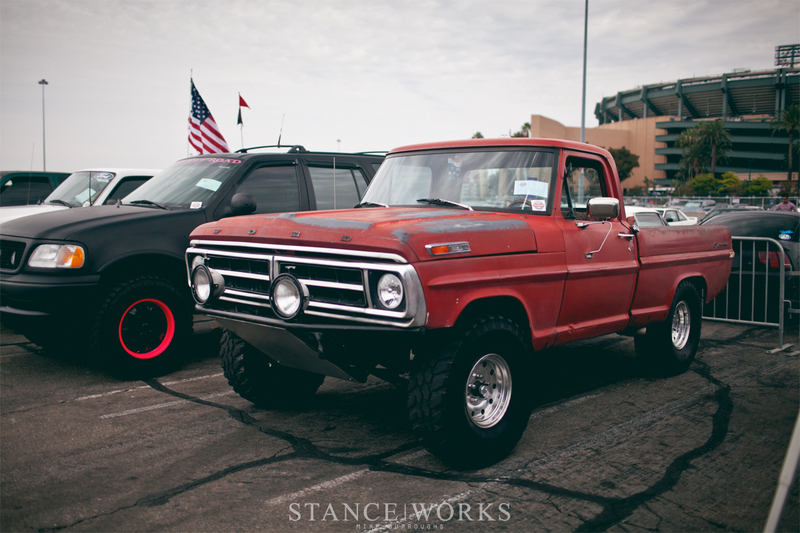 Our personal favorite was the classic of the bunch, a '70s-era Ford with some serious rubber, and some cage work in the bed to support some serious extended off-roading suspension. 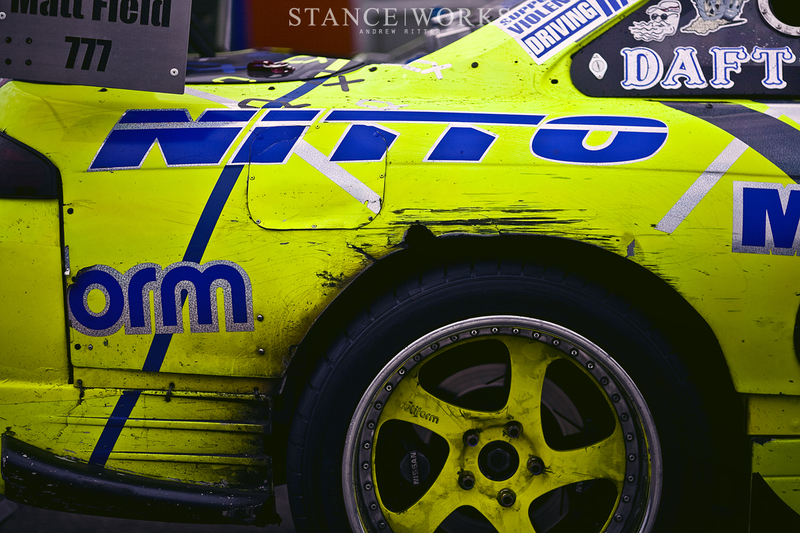 A retired presumed AM-General military vehicle, complete with Nitto stenciling, ended the lineup. With its caved-in doors, bashed in lines, and abundant rust, its hard to consider anything but perfect. 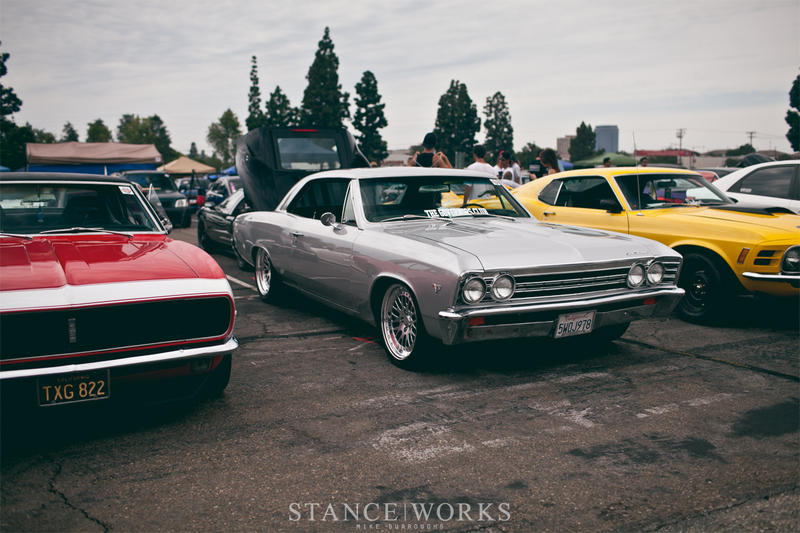 Much of SoCal's VIP scene arrived as well. Everything from the expected Lexuses and Toyotas, to VIP'd Priuses were present. Behind them, a row of American classics, ranging from Chevy's SS badging to Ford's Mach 1, and even a GT. It was hard to find anything that wasn't a part of Auto Enthusiast Day. A slew of gorgeous cars filled the LA Angels parking lots - far more than last year, and far more than we ever expected. 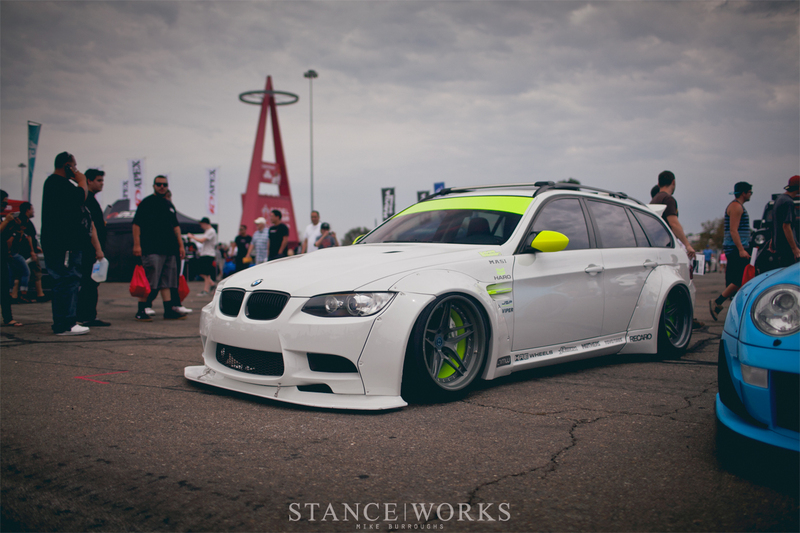 SoCal's car community is alive and well, and frankly, we're already looking forward to 2015, as it is sure to be bigger and better yet.